Leonardo Bonucci "expressed himself badly" in reacting to racist abuse suffered by Moise Kean, Juventus manager Massimiliano Allegri has said. 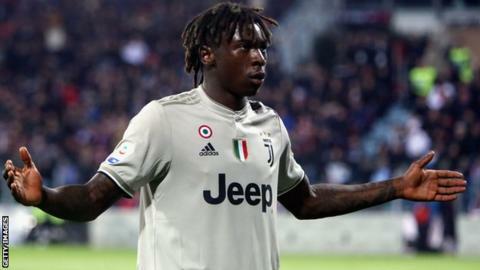 Kean, 19, was a target of racist chants at Cagliari with captain Bonucci saying the player's goal celebration meant he was partly to blame. But Allegri said: "With his mind still on the game, post-match, he expressed himself badly. "He realised this and apologised. These two things are distinct." Allegri added: "Racism must always be fought and is never justifiable." Kean celebrated with his arms out-stretched after scoring in the 2-0 win. Of his suggestion the striker was in any way to blame for the abuse he suffered, Bonucci later stated he was "clearly misunderstood" and was "too hasty" in his comments. The chants aimed at Italy international Kean prompted controversy in the country, with national team manager Roberto Mancini describing it as "intolerable" and calling for "tough" action against racism. Cagliari chairman Tommaso Giulini issued a statement calling for "commitment, culture and initiatives" in order to tackle racism in the game. "Racism is always to be condemned even in all its infinitesimal forms," said Giulini. On Friday, Serie A's disciplinary tribunal postponed a decision into the abuse, asking for more time to determine "the real dimension and perception" of the "insults". The tribunal did fine Kean for "diving in the penalty area" in the first half, for which he received a yellow card. The incident came eight days after England players including Raheem Sterling and Danny Rose faced racist abuse during a Euro 2020 qualifier in Montenegro. Tottenham's Rose has since said he "can't wait to see the back of football" and criticised the lenient punishment of racism in the game. Chelsea chairman Bruce Buck said the club had "changed" approach in tackling the problem, with a focus on education rather than banning supporters, while several Premier League managers have said they would be prepared to halt a game if their players were subjected to racist abuse. Troy Townsend - of anti-racism organisation Kick it Out - told BBC Sport: "I don't think black players have faith that these situations will be dealt with in a manner that will eradicate it. It has been far too long now. "I think we are really close to players taking the matter into their own hands now and saying 'enough is enough, I will not accept this anymore'. Players have been let down now for far too long."